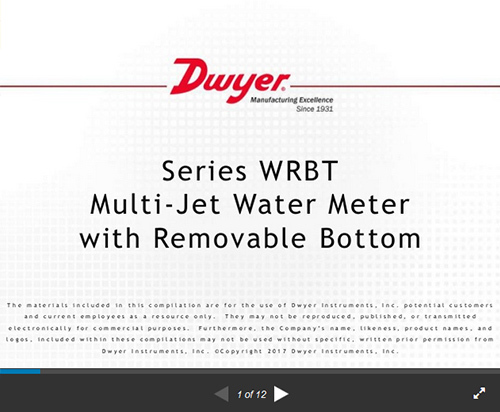 The SERIES WRBT Removable Bottom Multi-Jet Water Meters are a series of mechanical, water totalizing meters that display the total water usage in gallons with m3 options. They are available in a range of body sizes and include NPT or BSPT optional couplings. The ECO BRASS® body incorporates a removable section that easily disassembles for easy cleaning of any collected debris that may collect in the system while maintaining its performance. Body: ECO BRASS®; Couplings: ECO BRASS®; Measuring Chamber: ABS Plastic. Transitional Flow: ±3%; Nominal Flow: ±1.5%. 10 gal or 100 gal per pulse. See model chart*. Horizontal with register facing up.